What Was the Golf Club That Was Called a Spoon? 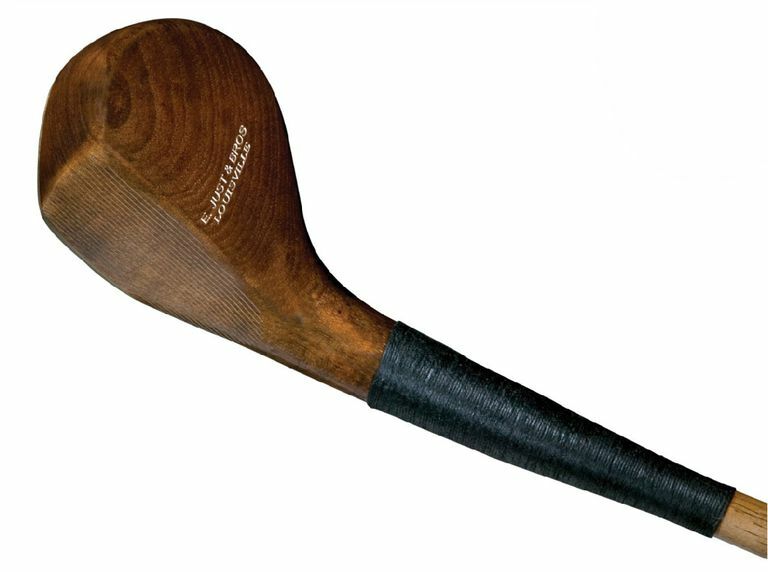 The golf club called a "spoon" was the wooden-shafted club in (primarily) pre-20th Century golf history that was most equivalent to today's fairway woods of various lofts - 3-woods, 5-woods, 7-woods. There were various types of spoons in addition to the standard or basic one. The "baffing spoon" was a higher-lofted version, akin to a 7-wood, for use when golfers needed to loft the ball higher, on a steeper angle. Sometimes the spoon was identified by its shape, such as the "long-nosed spoon," whose wooden clubhead was, yes, longer from heel-to-toe and more angular at the toe end; or the "bap spoon," whose clubhead was snubbed or bulbous in shape. A golfer carrying multiple spoons might refer to his long spoon, middle spoon and short spoon, where the length referred to shaft length. In pre-20th century golf, the wooden-headed club used from teeing grounds and off the fairway was most often the "grass club" or "grassed club." Spoons were the alternative for longer shots in which the golf ball might be sitting down in a depression or down in rough, or otherwise not necessarily in a good lie. Why Was It Called a &apos;Spoon&apos;? These clubs were known as "spoons" because their faces were, to some degree, concave (shaped like a spoon, in other words). Just how concave varied depending on the club's intended use and the whims of the maker or wishes of the clubmaker's client. The one in the photo, for example, displays some inward curving from its heel to toe, although you have to look closely to see it. Other spoons were concave to a much more pronounced degree. The Historical Dictionary of Golfing Terms includes a citation of the use of "spoon" from 1790, but the term was in use prior to that. Why Aren&apos;t Any Fairway Woods Called &apos;Spoons&apos; Today? Not so fast: Some are! From time to time a manufacturer of modern fairway metals will name one of its offerings after the old club called the spoon. It's just an appeal to nostalgia, in those cases. But there are some companies that make replica antique golf clubs such as the spoon for display purposes. And there are others - most notably, Louisville Golf - that make replicas of antique golf clubs that are designed for real use on the golf course. As for the reason why the name "spoon" died out of general use: The old names of golf clubs such as spoon were supplanted by the numbered-clubs system in use today. Today we say 3-wood or 5-iron or 4-hybrid. Matched, numbered sets of golf clubs began arriving en masse on the golf marketplace in the early 1930s, and the numbering system caught on. But the biggest reason the name "spoon" died out, at least an accurate descriptive terms, is that the "spooning" of golf clubs - making a club's face concave - became illegal under the Rules of Golf in the first half of the 20th century.